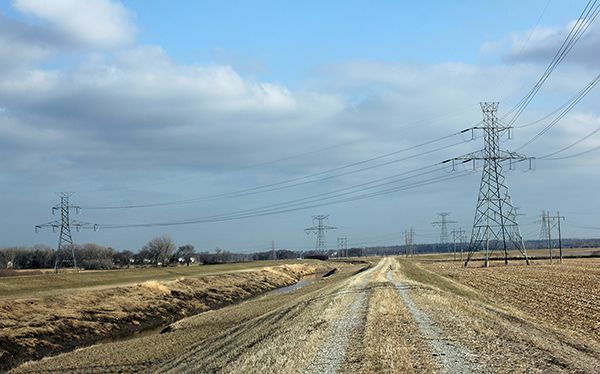 Farming the ground to the right of the levee is quite a challenge for the Fricke brothers as there are dozens of power lines that crisscross that piece of property. The levee system is part of the Big Papio Creek watershed. 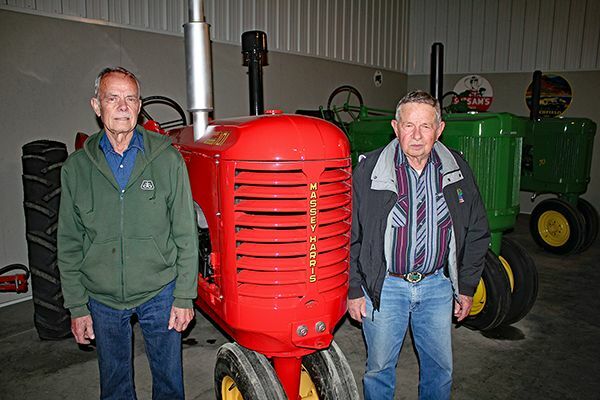 Charles and Milton Fricke, Jr. pose with the Massey-Harris tractor they restored in their farm shop that belonged to their father, Milton Fricke, Sr. “Dad drove it home from the dealership to the farm,” recalled Milton. For more than 40 years the Fricke family has watched the community of Bellevue creep toward the family farm. The first developments to the east and north of their farmstead went in during the 1970s and now completely surround the farm on those two sides. Today their homestead has been swallowed up by developments of mostly single-family dwellings. The “home place”— purchased by Milton and Charles Fricke’s parents in 1945 at 72nd and Cornhusker Road — was located in gently rolling hills with rich bottom ground on the Big Papio Creek. In 2005, with developments nearly surrounding their parent’s place, the Fricke brothers sold their first chunk of property to developers. It eventually became a Sam’s Club. While it didn’t happen overnight, the Frickes noted the first signs of urban expansion began in the 1950s, coinciding with the return of World War II veterans. Those numbers have exploded in the 60 years since Charles’ high school graduation. Both Bellevue and Papillion have two high schools each, with a third projected for Bellevue in the near future. Bryan High School, part of the Omaha Public Schools system, is in northern Bellevue, and draws students from both Douglas and Sarpy counties. The Frickes’ story is just one of hundreds being repeated not only across the Midwest, but across the United States. According to a May 2018 report in “Modern Farmer” magazine, 31 million acres of farmland have been lost to development between 1992 and 2012. That’s the equivalent of 175 acres per hour, or 3 acres per minute, being lost to development. Of those, 11 million acres were some of America’s best agricultural land. With 10 percent of the world’s arable acres located in the United States it is somewhat sobering to realize those acres for growing food for not only this country, but for the world, will not be returning to production. The study also noted that just 17 percent of American land is ideal for farming and the amount of the best land lost is about equal to California’s entire Central Valley. Scott Moore, a commercial real estate broker with OMNE Partners in Omaha, noted he brings a unique perspective to the urban sprawl discussion. His father was instrumental in the growth of Mid-Continent Properties, so Moore said he is well-versed in farm ground. He is also the only broker in the Midwest who specializes in commercial real estate that also has an auctioneer’s license. “I get involved in a handful of farm sales annually,” he noted. “In addition, I own property in west Omaha that is becoming surrounded by development. This falls in line directly with a June 2018 article for SF Gate earmarking the causes of urban sprawl as lower land rates, a rise in population growth and consumer preference, to name a few. “Farmers just don’t sell without reason. Their wealth is based on how many acres they farm and typically the goal is to pass the land on,” Moore said. “Farmers sell for two reasons — first, they have to, or second, they are retiring and moving to town, or they die. Now farmers know everything about what other farmers have been offered, Moore noted. If they are offered $40,000 or $50,000 an acre and know what the neighbor has been offered, chances are they will want $55,000. Such is the decision base for the Frickes. Both Milton and Charles love the land and the pieces of ground they have held on to have provided well for their families over the years. While both could retire, they only admit to the need to slow down and have let some of their rental ground go. Some of the best ground lies near the Big Papio Creek levee, which was the result of their father’s work. At one time, their diversified farms included corn, soybeans, oats, wheat and hay, along with all types of livestock, such as sheep, hogs, chickens and milk cows. As more and more development happened, the livestock left their farms. They had milk cows until 1995, up to 65 at one time. They milked cows before school every morning, the brothers recalled. They are now strictly row crop farmers raising corn and soybeans, but life surrounded by developments is a challenge. Joann noted she worries most at harvest. Her biggest fear is that someone is going to come down the hill from the north and hit a combine or tractor turning into the yard. “The guys are driving the combine and equipment home at night and the traffic just doesn’t slow down for them,” she said. Other accommodations for living in an urban environment include padlocked gates along the levee and certain other pieces of ground and locking all the farm buildings at night. The Frickes now hire their spraying done. While there is no one in the family interested in taking over the family farm ground — as, sadly, Milton and Joann’s oldest son died at age 55, and none of the grandchildren have shown an interest — both brothers aim to keep farming for the near future. They have invested some of their development earnings in farm ground in Saunders, York, Seward and Butler counties in Nebraska and also in Page County, Iowa. The Morton buildings and shop at Milton and Joann’s place serve the family well for all types of celebrations, ranging from anniversary and birthday parties to wedding dances. This spring, Charles’ twin granddaughters will have their graduation party at the shop. The development trend continues south and west, Moore said. As more farm ground in the metro area is turned into developments, landowners will face some tough decisions and if they have connections in other states or counties they may just take the money. “Farmers are not the most social individuals, but they will pick up and move if they have some type of connection familial or otherwise,” Moore added. He noted that most single-family developers are looking at that path that already has the infrastructure. “It’s time and cost, and after the single family dwellings go in, everything else, the apartments and retail, all follow,” he concluded.